This article is number 4 in the effective small business communication series. Have you ever wanted to write a better, more persuasive, and more compelling email? Even though it’s one of the most common forms of communication in small business, email is often overlooked in terms of time and effort. No Longer. Think about how many opportunities hang on a single email—a new sale, a new business relationship, an important proposal, and many other things. Some of these emails really deserve a lot of attention. Composing a persuasive and compelling email is something that takes practice, but it’s also a skill that will come to your service time and time again. Read on for some concrete advice that will have you writing powerfully compelling emails in no time. The average email user receives over 30 automated messages per week. On top of that, most people probably get another 30 cookie-cutter emails asking them for something. The bottom-line is: personalize your message to the recipient, and you’ll get noticed. Little things like mentioning something they did, or giving a reason you respect them, can make a big difference in your results. Compliments will also go a long way towards helping your cause. A business email is not the right medium to tell a story. The people who read it will want to get your message and go. They don’t want to be bogged down with flowery prose and eloquent description. Whether you’re sending an inter-office memo or a sales proposal, make sure you get right to the point. Keep it Short. Keep it Professional. Most of us get a lot of email, all of us are busy, and nobody wants to waste their time. For all of those reasons, it’s best if you keep your email message as short as you can. If you can say the same thing with fewer words, I’d recommend it. It is important not to go too short, however. By that I mean, don’t write like ur sendin a txt msg… Keeping your email professional is key, so it’s probably also a good idea to double check your spelling and grammar (especially if your first drafts are anything like mine). Standard email etiquette isn’t too rigid, so you shouldn’t have much trouble aside from that. Nobody wants to give something for nothing. It’s very important that you tell people upfront exactly why they’ll benefit from doing what you ask. If there’s nothing in it for them, chances are you won’t be getting an email back. If this is a sales email you’re composing, you should probably go even further than just a basic “what’s in it for them.” You need to give them enough benefits and reasons to buy that they will jump the buying hurdle and actually pay you. When you’re writing an email to ask someone to do something, make sure you make it easy on them. The harder it is for them to do, the less likely they’ll do it. A lot of times, it can even be useful to offer them something in return. I think that covers about all of the important points—can you think of any more suggestions? One more tip-send emails on Mondays-open rates are highest on Monday! Shama - that is a good tip. Sometimes things do have to go out immediately, but when it can wait a Monday is the way to go. This is great - I agree that “get to the point now” is critical! I was talking to a client of mine (health insurance company) about an email campaign they want to develop. For their email campaign, we decided that the email itself (designed to remind people who had received quotes in the past but never signed up) should be so short that a person would be able to read it in the time it would take to get the mouse up to the delete button. If they are interested in what they read, they can click for more - if not, the email gets deleted. However, had we not followed items 1 and 2 of your list, the email would have probably never been read at all and most certainly deleted without a click through. Count me among your newest subscribers! 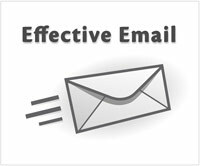 I have written many business email and have always got a response from each and everyone. The main reason behind this is that, I always keep my email letters short and professional. Never ever leave any chance for a spelling mistake, sign with, “With Best Regards, Yours truly’ etc.” This is an easy little way which is very simple to remember. Can you post a sample effective letter to introduce some one join company recently as export manager & want to introduce to existing clients of company. I am at the start of my career and it really helped me. It’s really helpful for the beginners who start their career.